Four young men arrested in Banbridge last Tuesday were part of a criminal gang who crossed the border to commit daylight burglaries looking for cash and jewellery, it was alleged last Thursday at the local magistrates court. And it was claimed that one of them when he was arrested was wearing a designer watch stolen in one of the burglaries. Standing in the dock at the court were Patrick Casey (19). Greenbrae, Strabane, and Leon Dillon Hutchinson (18), Drumcairn Avenue, Dublin. Sitting outside the dock were two juveniles aged 17 and 16, both from Dublin, who cannot be named for legal reasons. All three were charged with the theft of jewellery on May 3 this year in burglaries at Dromore Road, Laurel Heights and Tudor Oaks, Banbridge. A public prosecutor said that police attention was drawn to a white VW Jetta acting suspiciously in the Dromore Road area of Banbridge around 1.20pm. They were approached by a member of the public concerning a burglary at Dromore Road and there were also reports of suspicious activity at Laurel Heights. The defendants were arrested at Linehall Street and around tea time a further burglary was reported. All four were taken into custody, the car was seized and their clothing was also seized. The prosecutor added that the houses had been ransacked and jewellery stolen. There were footmarks left at the scene which allegedly matched some of the footwear of the accused. She also said that one of the defendants was wearing a watch which engraved for a 60th birthday and confirmed as stolen. A detective constable who said he believed he could connect the defendants with the charges. He added that police believed the accused were part of a gang who constantly changed vehicles and used the A1 to carry out burglaries during daytime in the Armagh and Down areas. The officer said it was a very complicated case and at an early stage with forensics and DNA testing to be carried out. 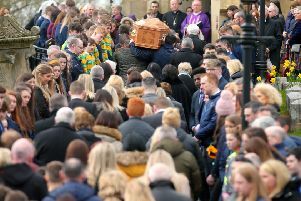 Mr Conor Downey, representing Casey, said he had spoken to his client’s father in Dublin and he was willing to put up a substantial cash surety. Casey was also willing to live with his uncle at the Legahory halting site in Craigavon. A solicitor representing Dillon Hutchinson said his mother and father had managed to raise 2,500 Euros for a surety but could not provide a bail address in this jurisdiction. A solicitor for one of the youths said there was a cash surety available while a legal representative of the other youth said there were bail addresses available in Belfast and Newry. District Judge, Mr Eamonn King, said there was a pattern involving people driving from one jurisdiction to another along the A1 involving burglaries during the day for cash and jewellery. He added that the burglaries involved forced entry and ransacking of houses. Judge King said the court had been told the case was at an early stage with forensic investigation on footwear and clothing to take place. He added that if the four defendants were involved in this enterprise they would face custodial sentences. Judge King said he was satisfied that if the accused were admitted to bail that they may not return to the jurisdiction. He refused bail and remanded all four in custody to appear by way of videolink on June 2.